This is a great craft for Summer Camp or a group activity at school. As a warning, if you show the kids how to make these at a Summer Camp, you will most certainly have ttrouble with the children sandpapering at the table, in baseball games, and even in bed after lights out. There is something very intriguing to children when initials or names can be put on a project. This craft requires parental assitance and supervision. (Parental Assistance and Supervision Required) Use 1/4-inch hardwood scrap. The best way to set this up for your campers or students is to pre-cut a lot of shapes: diamonds, squares, triangles, rectangles, odd shapes, out of assorted kinds of wood, and stow these in a cigar box. Let the children poke through the box and choose their own wood. These shapes can be used as they are by younger children. Older children (with adult supervision) can shape and cut them to other designs, Iike a maltese cross, heart, filed lines, or initials. Drill a small hole at the top of the design for a string, before shaping the wood, and it won't be so likely to break. 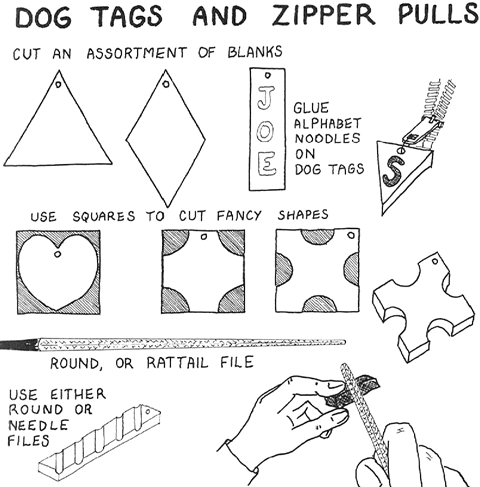 For dog tags, glue alphabet noodles for initials or names. For zipper pulls, omit the noodles, as these will not stand up under rough handling. Instead, paint designs on the smoothed wood with nearly dry watercolors. When noodles on the dog tags are dry, they also can be painted with dry watercolors. The best effect is achieved by painting only the top surfaces of the letters. When dry, attach a short string through the drilled hole, dip in shellac, and hang up to dry on a nail. This will preserve the colors, and help the noodles stick on better. When working with noodles yourself, don't feel that the children can't do it well if you can't. This is one of the few skills children can do better than adults. The noodles are suited to their smaller fingers.